A Studio 450 Wedding takes place in a penthouse duplex high above Midtown Manhattan. The location is a coveted setting for corporate gatherings, weddings, media events, bat/bar mitzvahs, pop up stores, fashion shows, product launches, fundraisers, cocktail parties and other special events. The New York City event Loft Space is encased by large windows and includes a rooftop terrace where guests can fully experience the incredible view of the city skyline. Studio 450 Wedding events are truly something to behold. Weddings at this venue have the classic Big Apple flare, as the bright lights of the city twinkle below. 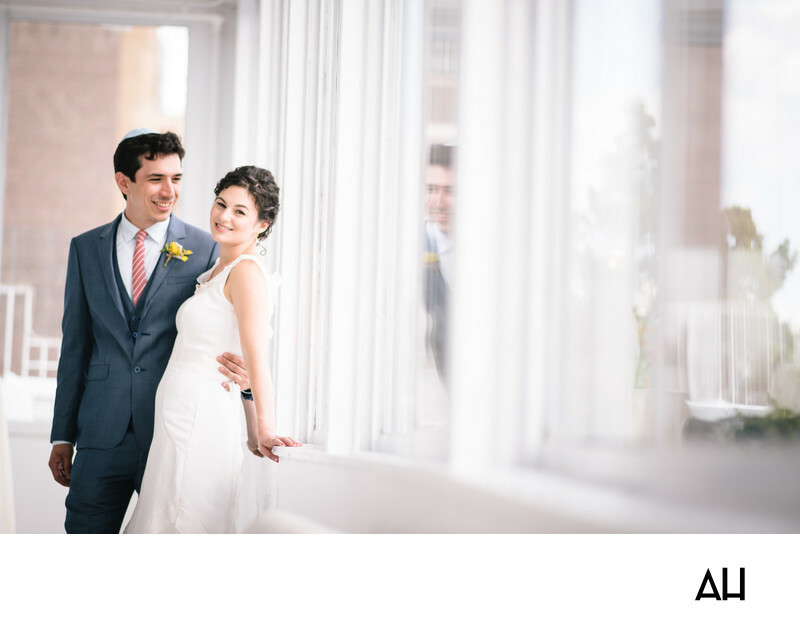 One of the main attractions of the space is the open windows thats look out over Manhattan, and make for gorgeous wedding pictures. In this particular photograph I did not use the windows for their view though, I used them to highlight the lovely bride and her groom. The bride is radiant as she gazes toward the camera, the happiness of the day shining out of her. The groom on the other hand, has eyes only for his new wife. The picture is posed, but the couple is so relaxed and at ease together that one would never know it. The windows to the left of the bride reflect the love the couple has for each other as they embark on the journey of their marriage.